Bring large saucepan of water to a boil. Add potatoes; cook 5 to 8 minutes or until fork-tender. Add green beans during last 4 minutes of cooking time. Drain potatoes and green beans. Stir yogurt, vinegar, oil, mustard, and salt in large bowl until smooth and well blended. 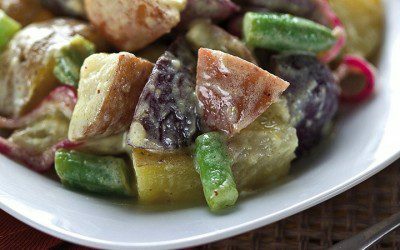 Add potatoes, green beans, and Pickled Red Onions to dressing; gently toss to coat. Cover and refrigerate at least 1 hour to allow flavors to develop before serving. Exchanges per serving: 1/2 Bread/Starch, 1 Fat, 1 Vegetable.